The one thing I don't understand about the P4N Diamond is how the two dual channel DDR sockets are colour coordinated. 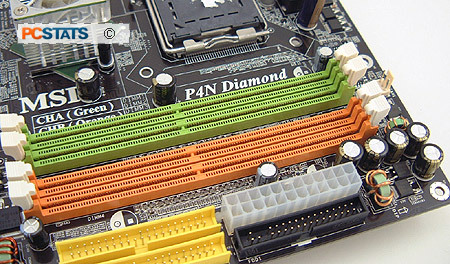 On most other motherboards, memory slots of the same colour indicate which DIMM slots need to be occupied in order to enable dual channel memory operation. On MSI motherboards, the colours indicate memory channels A and B. That means if you put the memory in adjacent slots, the memory will operate in single channel mode. Confused? So are we. Another thing I'm not particularly impressed with are the shoddy rounded cables that MSI includes with its motherboards. These cables are just regular IDE cables folded and wrapped in plastic and are not like the true rounded cables you might buy in the store. Other manufacturers like Epox and ABIT include high quality cables, if MSI is making the effort to add value there's no sense in cheaping out. The MSI P4N Diamond motherboard sports two pretty large chipset heatsinks. The NF4 SLI is cooled by a medium sized active heatsink while the nVidia MCP04 Southbridge is cooled by a passive heatsink with copper core. Both chipset heatsinks are removable and can be replaced by third party chipset heatsinks such as the Thermaltake Crystal Orb, Vantec Iceberq or Zalman Northbridge coolers if desired. The area around the MCP04 is a bit on the tight side however so finding a cooler that fits may be difficult. During testing the NF4 SLI Northbridge stayed relatively cool and was only moderately warm to the touch. Not a surprise since it is actively cooled. On the other hand, the MCP04 passive heatsink was very hot - I think a fan is what is really needed on this chipset. nVIDIA is not alone with chipset heat issues, Intel's 955X and ICH7 also suffer from the same heat problems. In any case if you plan on getting a top of the line motherboard, you better make sure you have adequate case cooling. I am happy to see that MSI equips the P4N Diamond with a Silicon Image SiI3132 PCI Express x1 based Serial ATA II controller instead of the older SiI3114 Serial ATA I PCI controller. By default the SiI3132 comes with two Serial ATA II ports, and thanks to its port multiplier capabilities, you can actually hook up to 30 HDDs (fifteen on each port) to the controller. You'll need the associated port multiplier hardware which can be difficult to find now, but is certainly going to be a popular NAS solution in the coming months. Most high end motherboards come with dual Gigabit NICs, and the MSI P4N Diamond is no different. The first nVIDIA Gigabit network card runs through a special bus that connects to the nForce4 SLI chipset, but there is a bit of confusion about the second onboard Gigabit NIC. 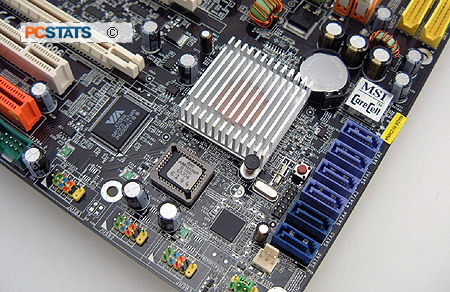 According to the manual's motherboard specifications, the second onboard network card should be the Marvell 88E8053. Yet what we see on the motherboard is the Marvel 88E1111 Gigabit network card.... While that might not sound like a big deal, it is after you consider the 88E8053 is a PCI Express x1 device while the 88E1111 found on the motherboard runs through the PCI bus.